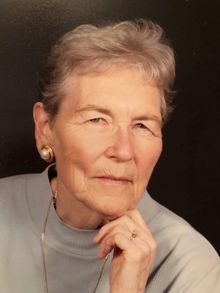 Henrietta Hope Williams Keyser, 86, departed this life peacefully at the The Osborne retirement community in Rye, NY on Saturday, August 25, 2018. Henrietta was born on April 26, 1932 in Huntington WV, the daughter of the late Henry F. Williams and Cavanaugh Williams. She was preceded in death by her husband, Rupert Hugh Keyser. Henrietta grew up in Westmoreland and was a member of the class of 1949 at Vinson High school. She graduated from Marshall College, and was a member of Tri-Sigma sorority. While at Marshall, she met and fell in love with her future husband Rupert (Rupe), and they were married in Huntington in 1951. She was a teacher in the Logan county school system, a teacher and Principal at Fairland East Elementary School and an educational consultant for Ohio University. "Hank" was an avid homemaker and gardener who loved being home with her children. Hank and Rupe enjoyed traveling and spending time with family, especially their six grandchildren. A favorite family trip was the Keyser/Romine adventure by train out west to see Glacier, Yellowstone and Grand Teton National Parks. Upon retirement, Hank & Rupe relocated to Winston Salem, NC and then Rye, New York to be near their children. At the time of her death, Henrietta was a member of the Huguenot Memorial Church in Pelham, NY. Always kind and compassionate, Hank lived life to the fullest, using her faith as a beacon in all that she did. She will be greatly missed by the people in her life who loved her. In addition to her parents and husband, she was preceded in death by her three brothers, Paul Williams, Walter Williams and Joe Williams. She is survived by her son Jeffrey L. (Beja) Keyser of Pelham, NY; her daughter Mary Ann Romine (Chuck) of Winston Salem, NC; and her grandchildren, Meredith (Geoff) Blanding; Elizabeth Keyser; Edward Keyser; Thomas Keyser; Jeffrey Phillip Keyser and Alexander Romine. A visitation and remembrance service celebrating Henrietta's life will be held at the Woodmere Cemetery chapel on Thursday, August 30th at 10:30 am, immediately followed by burial at Woodmere. Reverend Eric Porterfield of Fifth Avenue Baptist Church will lead the services.